2. The AGRICET Entrance test is 1.30 hour duration and the question paper consist of a total 120 questions. 3. All question are objective type (multiple choice) only and each question carries one mark. 5. Medium of Entrance Test: The question paper contains questions in Telugu medium. 1). S.V.Agricultural College, Tirupati, Chittoor District. 2). Agricultural College,Bapatla, Guntur District. 3). Agricultural College, Naira, Srikakulam District. ii. Private Agricultural Colleges :The total number of seats reserved for Diploma holders of Agriculture and Seed Technology in all private Agricultural Colleges(6) are 72 and out of these 72 seats 65% of the seats will be filled under Convenor Quota at the time of counseling and the remaining 35% seats will be filled by the Management of Private Agricultural Colleges from the merit list obtained from the AGRICET-2019 examination by duly following the rules and regulations of the University. The Candidates should have passed two year Diploma in Agriculture/Seed Technology from ANGRAU/PJTSAU. (those who are going to complete the diploma requirements in 2016-17 academic year can also apply for this CET). The candidates shall be required to have completed 17 years of age as on 31st December of the year of admission with an upper age limit of 22 years for all the candidates and 25 years in respect of S.C, S.T and 27 years in respect of PH candidates. 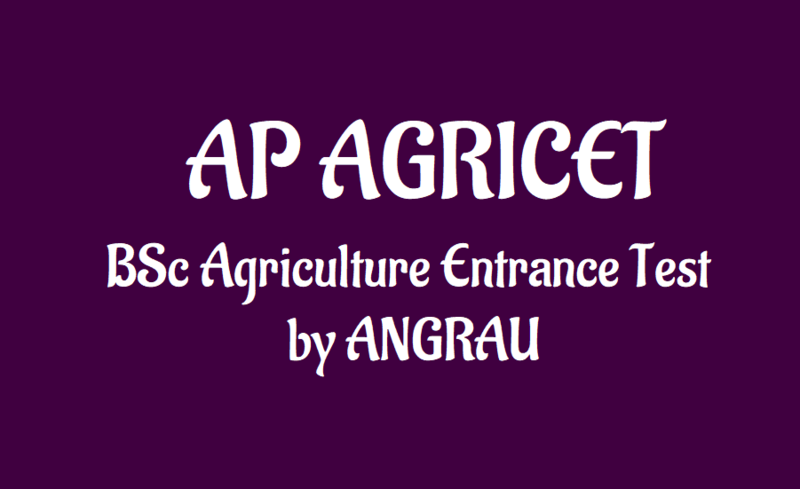 Admissions will be made strictly as per the rule of reservations of ANGRAU based on merit through the Entrance examination in Telugu language (objective type) to be conducted at College of Agriculture, Rajendranagar, Hyderabad - 500 030 and Agricultural college, Bapatla, Guntur District - 522101 for Seema Andhra region polytechnic students as per schedule. Application form can be download from the University website:www.angrau.ac.in. The list of eligible candidates along with the hall ticket numbers will be displayed in the University website on 20-07-2019 those candidates who have not received the hall tickets can however download the Hall Ticket from the University website and attend the Test.